In 2009, Lillie Marshal quit teaching and decided to travel the world. She took a year off, circumnavigated the globe, including stops in Japan, Laos, Thailand, Cambodia, Vietnam, Italy, Ghana, Spain and Portugal. She is now back teaching in Boston Public Schools, has a new family, and yet still finds time to travel and write about it. 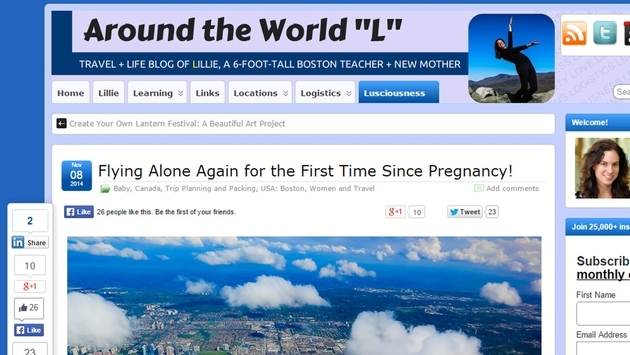 Lillie has written over 600 posts since her blog's inception, and they are great. In keeping with the “L” theme, she has her posts split up into Learning, Links, Locations, Logistics, and Lusciousness. A lot of the travel blogs you've seen in this space simply offer up advice. Not to discount some of the great tips on Llillie's blog, but the reason why I like it so much is because she is a storyteller. And if you are a teacher, check out her other website, www.teachingtraveling.com. There she helps teachers travel and travelers teach. So if you are looking for a place to teach ESL or you enjoy traveling enough to want to make a career out of it and use teaching as a way to pay for it, this is the site for you. Both of Lillie’s blogs are great and definitely worth the read.